Steel, the world's foremost construction material, is an iron alloy that contains between 0.2 and 2 percent carbon by weight. The advent of commercial steel production in the late 19th century was a result of Sir Henry Bessemer's creation of an efficient way to lower the carbon content in cast iron. By lowering the amount of carbon in iron to about 2 percent, the much harder and more malleable metal product of steel is produced. However, for a 360 view of the History of steel, you'll have to go back 4,000 years to the beginning of the Iron Age. Steel has been with us for a very long time. Today, most steel is produced by basic oxygen methods (also known as basic oxygen steelmaking or BOS). BOS derives its name from the process that requires oxygen to be blown into large vessels containing molten iron and scrap steel. Although BOS accounts for the largest share of global steel production, the use of electric arc furnaces (EAF) has been growing since the early 20th century and now accounts for about one-third of all steel production. Steel has a wide range of alloy compositions, which allow it to have diverse mechanical properties. 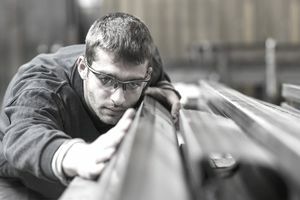 Different types of steel are produced according to the properties required for their application, and various grading systems are used to distinguish steels based on these properties, which include density, elasticity, melting point, thermal conductivity, strength, and hardness (among others). To make different steels, manufacturers vary the type and quantity of alloy metals, the production process, and the manner in which the steels are worked to produce particular products. It is steel's properties that have made it the most widely used and most recycled metal material on earth. From stainless and high-temperature steels to flat carbon products, steel's various forms and alloys offer different properties to meet a wide range of applications. For these reasons, as well as the metal's combination of high strength and a relatively low production cost, Steel applications make steel a durable and aesthetic metal used today in countless products.